These garden calendar pages outline seasonal jobs that you should do to keep your garden looking its best. The guidelines are organized not by months, but by season – early and mid spring, summer, fall and getting ready for winter. The information here is most appropriate for North American hardiness zones 2 to 7. The best way to use the seasonal lists below is to consult and print them at the beginning of each season as a reminder of the jobs you should ideally do at that time of year. 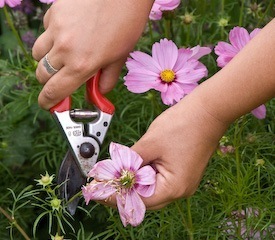 With some garden tasks, timing is vital: transplanting and pruning. Leaving either of those tasks too late can create problems. If you prune a lilac too late in the season, for instance, you will cut off the buds that produce next year’s flowers. Likewise, you don’t want to move shrubs or divide perennials in the heat of midsummer because the stress of the heat, dryness and the loss of roots will set the plants back too much.